In 1999 a pro-democracy movement in Nigeria successfully ended the nation's 33 years of military dictatorships, and a Christian was elected president. Prior to that time Nigeria had been ruled primarily by dictators from prominent northern Muslim families. When the Christian was elected, 12 Muslim controlled states in northern Nigeria responded by imposing Islamic sharia law in open violation of the Nigerian constitution. In April of 2011 another Christian from southern Nigeria by the name of Goodluck Jonathan was elected President in what Western observers declared were the "freest and fairest" elections in the nation's history. The Muslims in the north responded to the outcome of this election with an explosion of violence. The level of the violence was staggering. In a period of 48 hours, 764 Christian churches were torched, 204 Christians were murdered, more than 3,100 Christian-operated businesses were set ablaze, and over 3,400 Christian homes were reduced to rubble. Since that time a jihadist terror group known as Boko Haram has been attacking Christians relentlessly, burning their villages and churches to the ground and killing as many people as possible. Thus far, the national government has done nothing to stop the violence, nor has it provided relief aid to the Christian communities. The government's inaction is most likely due to a fear that any intervention would ignite a religious war that would lead to the secession of the northern states. 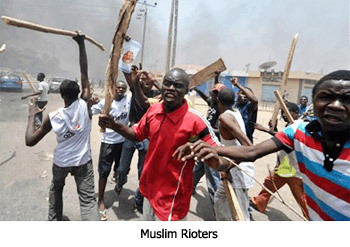 The situation has become so bad that Nigeria now leads the world in Christian persecution! 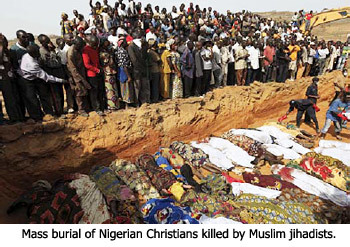 During 2012, 70% of all the Christians killed globally for their faith were murdered in Nigeria. The President of Nigeria recently offered to give the members of Boko Haram complete amnesty if they would stop their murderous rampage. This offer outraged Christian leaders. The leaders of Boko Haram mocked the offer, saying they had done nothing wrong. 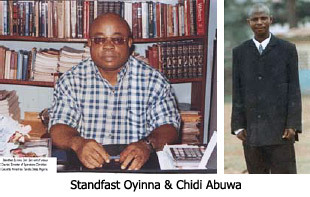 They continue to present themselves as "freedom fighters" who are trying to liberate Nigeria from Christian dominance. In the midst of all this chaos, there is a wonderful man of God by the name of Standfast Oyinna who is attempting to minister to the thousands of Christian refugees who have been burned out of their homes. His life has been threatened repeatedly, but in fulfillment of his name, he has decided to stand fast and do everything he can to assist his brothers and sisters in Christ. We have had an ongoing relationship with Standfast for over 30 years. We know him well. He is a dedicated and trustworthy servant of the Lord. What makes his situation particularly interesting is that his particular tribe considers themselves to be of Jewish descent. In one recent Muslim attack, a young Christian minister by the name of Chidi Abuwa had to flee with his wife and baby, leaving behind two of his older children whom they could not find. When they were able to return to the village, they discovered it had been burned to the ground, and many of the children had been thrown alive into wells. Chidi and his wife were heartbroken. We joined with Standfast and his people in praying that Chidi's children would ultimately be found alive. Two weeks later, a family returned to the village with Chidi's children. The Abuwa children had been playing with theirs when the attack occurred, and all of them had fled together into the jungle. They lived on herbs and crickets for two weeks, until they felt it would be safe to return. Due to generous donations from our supporters, we have thus far been able to send a total of over $40,000 to Standfast to use for relief aid. Each time, he sends us a detailed record of how he spends every penny. Please pray for God to surround him with protecting angels, and pray for the effectiveness of his relief efforts. Also pray for the national government to take decisive action to protect Christians. And please consider a special donation for the relief efforts. Just designate it for Nigeria. While reading this all I could think was "What can we do?" over and over. 1. Giving us this vital news. 2. Giving us the answer to the question...pray and donate! If possible, could you please give us an update occassionally on this situation? Latest update is that Boko Haram attacked Standfast's village again. As they hacked through the crowd with machetes, Standfast's son put his arm up to protect a blow and lost his hand. Surgeons have tried to reattach it, but that's a lot of nerve damage. Hey, I appreciate your writing. Many individuals they slaughtered in a bomb impact at Kano State School of Hygiene. The impact was credited to activist gathering Boko Haram by local people.